It was a long, long time ago… As every good story should start… Or maybe not really?… Anyway… This time it really started many years ago. It started when I decided to try something a bit more advanced. When I finally joined a roto league, encouraged by fellow fantasy basketball managers who told me that, yes, playing fantasy points is ok, but rotisserie competition is what brings real fun. And they were absolutely right. One of the reason it’s really exciting is because there are so many details you need to consider when building your team. It was quite easy with fantasy points. Just bringing your projected stats, calculating them with all the league wages and magically you get players’ values ready to be used. And then you can draft based on them sorted and just consider position eligibility to get a legal roster. A piece of cake. Unless your projections are bad J… or you’re just unlucky with health. With roto? It’s all not that easy. Yes, there are rankings published by some websites, even some huge ones. And they can help a bit with evaluating players but unfortunately there are some cons related to them. First of all in most cases it’s hard to tell if they’re made for H2H or roto. And in most cases one could say it’s for both a little bit. Which essentially means they’re not really for roto nor for H2H. And finally, what made me rethink the team building strategy – they all tell you how good a player can potentially be… just not in the context of your team, which is CRUCIAL in those more advanced fantasy basketball formats. A bit more help you can get from values calculated with z-score algorithm, just as those you can find in FB Ninja fantasy basketball player rankings. 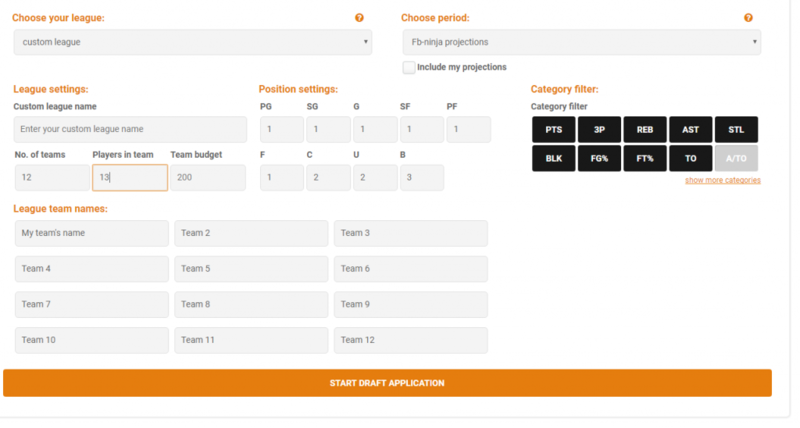 You can tailor them precisely to your league size and categories played. You can even tailor them in line with your strategy… if you have any… and if your competitors will allow you stick with it. Yes, there’s nothing worse during your draft that one or more rivals trying to go exactly the same path. And picking up your targeted players just in front of you. Or bidding to some crazy prices. and sometimes everything goes as expected and you end up with one of your targeted groups as a whole. More often – someone is missing on your squad and you have some other player instead which makes all that precisely planned team much less efficient. Just because flow of the draft itself makes you improvise each time something goes in a bit different direction. Something that not only brings evaluation to my currently drafted group of players but also gives best possible groups that could be drafted in order to get the most out of all the categories played in the league. Of course, it’s useless to compare the team being drafted to all the remaining teams, especially in some early rounds. One competitor could start with bigs, other with small ball players which doesn’t mean these are the types of profiles you could eventually expect from them. If it’s auction – things get complicated even more. One could start with his franchise player while other could get someone designated to the bench. So while such comparison is a good idea at the end of your draft, it brings close to zero value early on. The problem is that we need something to rely on right from the start. The answer? Every league is different. Not only just because they play different settings with different number of teams. So one could say comparing leagues doesn’t make a lot of sense. That being said, from my experience I could tell you that if your team looks good in such comparison – it could do just fine when the real season starts. And going this way allows to avoid some so called “hype traps” which I’ll talk about later in more details. 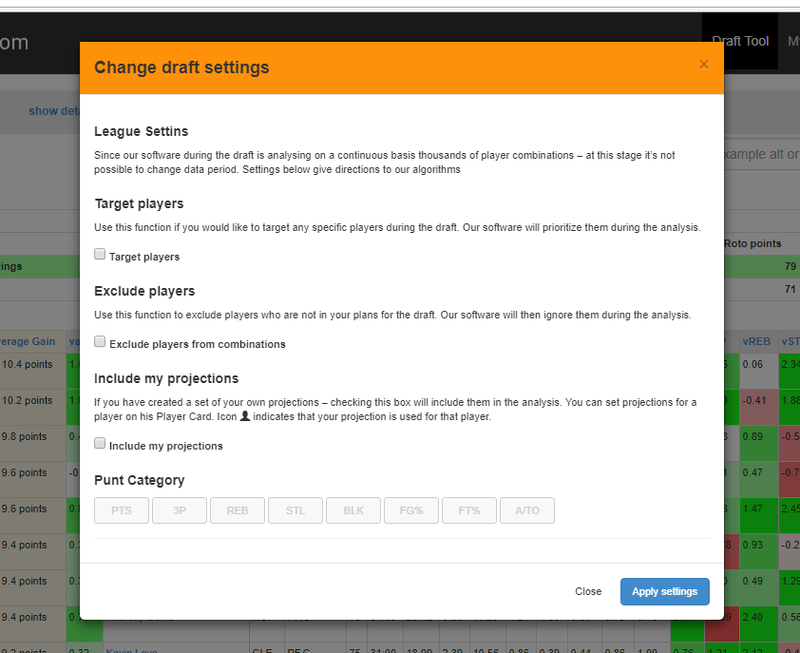 So the draft tool uses its league models, carefully built on results taken from other leagues using the same settings with all the NBA latest trends taken into consideration. So right from the start your team has a pattern to be measured against. And even if some initial comparison will not tell you the whole story – for just the same reason with franchise players usually being taken first – soon you’ll find out building paths that will make your team look optimized. First things first. The tool is not going to help you until you meet some requirements and tell it a bit about your preferences. So first of all it needs to know what kind of draft you want help with. If it’s one of your synchronized leagues from Yahoo! Or ESPN? Or maybe a fantasy basketball mock draft? Or maybe even a totally custom league? Please notice that the only way of drafting with the Draft Tool and online ESNP draft window together is using the html version of the ESPN application. The flash one doesn’t allow for outside data transfer so that the Draft Tool would not know the draft results. We also strongly recommend using Chrome or Firefox as you browser because others could have problems working with technologies we implemented to provide you with such a powerful application. Depending on your draft format choice, you may be asked for a bit more details. If it’s fantasy basketball mock draft– a link to your mock draft window will be needed. For custom leagues all the league settings need to be provided manually as we don’t have any other source apart from your keyboard here. As we know you can’t wait to start, there will be some default values entered but please make sure you customize them exactly in line with the settings you use. The other important parameter to be selected is a sample period of player statistic data. You can choose from a variety of sources, like FB Ninja projections, last year’s player stats or even a bit smaller samples of data, all within your choice. And that’s all. Now you can start drafting! When you finally get to the tool’s window, the biggest visible part is a list of all available players. Nothing new, a typical ranking list, right? Wrong! Sure, it’s basically a ranking list with z-score values and so on, but the real drafting meat here is the “Average gain” column. What’s that? Try to click the “+” button next to the value. Boom! Here you have a sub list of five the most efficient core player groups including those already taken by you (if any) and the player you’re just analyzing. Each sub row starts with a model roto score that you’ll get from the selected core group if you successfully go this path. Of course, the bigger the better. And the average score of all those sub rows is that “Average gain” value. Yes, the first look at the top suggested players could be confusing. Why some typical role players are displayed higher than some absolute stars? Well, that’s because role players matter also in fantasy basketball. Particularly in roto. A lot. Does it mean you should spend your early pick or tons of auction money on one or more of them? Not necessarily. Does it mean you should keep your eye on those role players and make sure you get them eventually? Of course! In roto a good and fitting role player could be much more valuable than a good and not really fitting star. It’s up to you how you use such information. If you base only on the “Average gain” – you could end up getting role players too early or pay for them too much. If you ignore this column completely and rely solely on the score value (“value” column) – you get basically nothing more than a simple draft tracker with no real added value. To get the most out of the tool you should usually consider them both. Once a while the tool does a really heavy work hidden behind a busy indicator displayed for you. How often? After every pick is made if you enter them offline. Or once it detects that new pick have been made after getting online draft results. Usually online draft results are taken once in a minute unless you wish to update the results more frequently by pressing the “refresh” button. As I mentioned earlier the draft strategy is not set in stone with the FB Ninja Draft Tool. And that short window freezing moments mean that your suggested strategy list is being slightly altered… or maybe not… Whatever the case is, you can be sure that after each such update you’re provided with updated set of scenarios ready to be presented for you. No matter if it’s just the beginning or you’re starting to shape up your team. … until the end of your draft… until the end of your bench. Actually many drafts go really quickly and it’s hard to find time for reading anything else than just the list of available players. That being said managers exist that periodically like to review current draft results or team rosters completed so far. That’s why such views are also available for you in the Draft Tool. – track all the time how your team looks in comparison with both the league model and the rest of the league using the “show details” option. You’ll be surprised how close both metrics will get when your draft ends. – include your own projections if you entered them previously on player profiles. – try to implement a punt strategy. Yes, it’s not that popular in roto but works in some league landscapes so it’s always worth to be flexible. So… ready for your draft? You’ll be always ready as soon as start using the FB Ninja Draft Tool. And as always – we strongly believe our tools are a real difference maker but if you have any suggestions on how to make them even better and more useful for you, just let us know. Thanks in advance for a good feedback. I’m confused about how to make this work with an ESPN draft. Can you please explain the optimal setup? If I open the flash draft in another window the draft tool will not update? How do you draft using the HTML version of the app? Thanks for your help. updated draft results. If your draft is snake you will get a link to lite version, if your draft is auction unfortunately no one can do nothing with it. Are the Magic’s Breakout Players for Real?